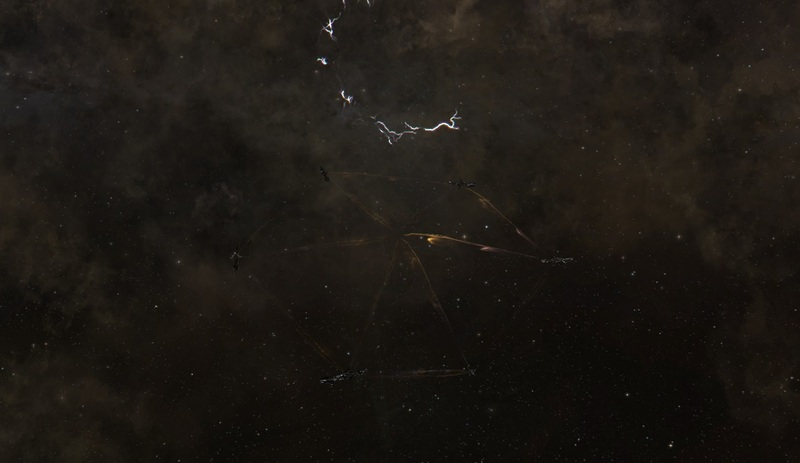 In an effort to get a better understanding on the Unidentified Cloaked Structurexs (UCS), also known as Pillars that are present in many systems across New Eden, a science expedition was set up by capsuleer Feu dAstres. This science expedition had as goal to see if there are any reactions when supplying/draining energy to an UCS/Pillar. In his wake, several Arek'Jaalan members also followed suit, setting up their own science experiments! The Expedition occured on 26 January, Sunday, in the Athinard system. This system was chosen as it held an UCS/Pillar & was just a single jump from Dodixie, a large tradehub! Handy when you were after specific science equipment or ships to assist! The experiment was divided in two parts. First a fleet would pump as much energy into the Pillars, seeing if there's any reaction from the structure. Failing that, energy would be drained from it, as perhaps that could result in a reaction. Energy Experiment part 1: Energize! First stage, powering up the structure! In this stage, 5 Hyperions were used, alongside an Osprey to boost the energy of the Pillar. The Hyperion was a favored ship, due to it's combination of powergrid & capacity, allowing it a wide range of fits & the knowledge it had the cap required to feed these energy-hungry experiments .The module used to transfer energy was the Large Remote Capacitor Transmitter. A single one of these can transmit 351 energy every 5 seconds. The specially fitted Hyperions of the science expedition carried 7 of these modules, to be run continuously. This means they transferred over 10.000 energy every 5 seconds to the Pillar! A staggering amount! Add the Osprey on top of this, and it was a good estimation that if this didn't sort a reaction from the Pillar, no amount of energy fed to it would! After a few hours of feeding energy to the installation & spotting no obvious change or reaction from the Pillar, tactics were adjusted to prepare for the second part of the Energy experiment. Addendum: During the switch from Energize to Deplete, Che Biko fired a multispectral ECM from the 'bottom' of the structure to the 'top' where lightning is most observed. No notable reaction came from the Pillar structure. Energy Experiment Part 2: Deplete! The second part would see the use of Energy Neutralizers & NOS modules, in order to drain away as much energy as possible! For this, two ship types were used. One was the Hyperion, modified to drain energy with Heavy Energy Neutralizers and Large Energy Siphon Modules The other is the Curse, specialized in energy depletion, allowing it to be as efficient with medium energy neutralizers. The Osprey remained in field, in order to boost the energy of the participating ships, allowing them to drain energy indefinitely. With these ships on field, no known energy capacitor would be able to survive such onslaught of energy depletion! However, after a prolonged time, the same conclusion had to be drawn as with the energy boosting. Despite great efforts, no change or reaction was observed, neither from the Pillar as the Seekers who often checked in & scanning us. 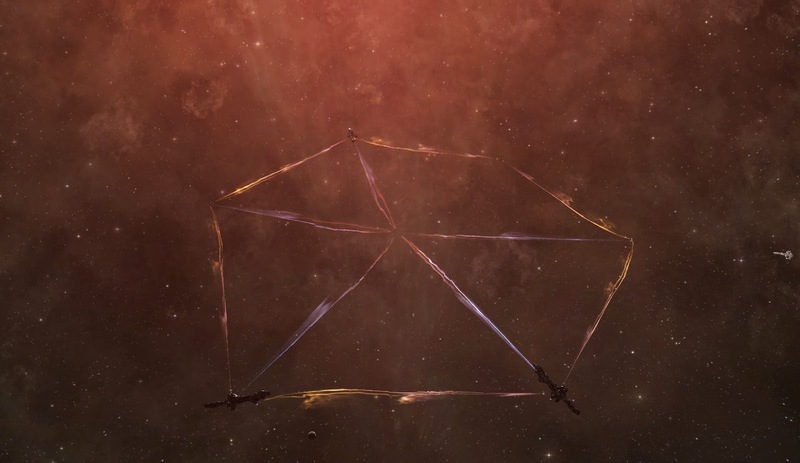 In addition, two members of the Arek'Jaalan science community performed experiments of their own on the structure, in the hope of elarning more about it. 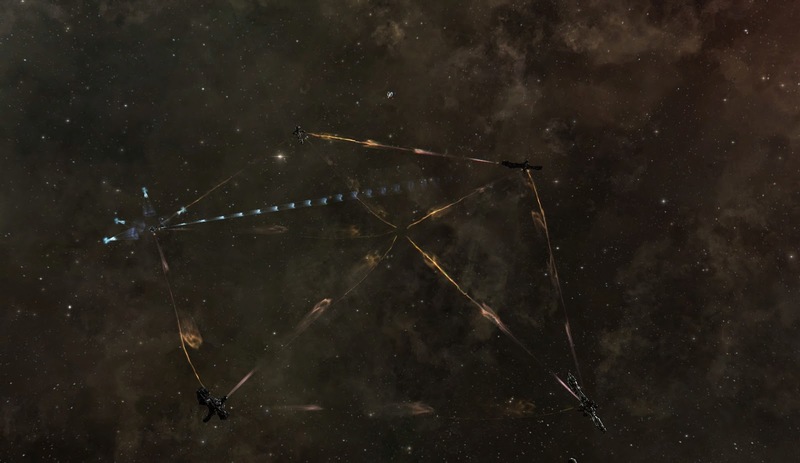 Arek'Jaalan coordinator Frenjo Borkstar used pulse lasers for a long duration on the structure, without any effect. A webifier was also used against it, without any response from the Pillar. However, Frenjo Borkstar's engagement of the Sleepers did provide confirmation of various observations made on their behaviour. -Sleepers fire back, fire on one member of the group, they all fight back as group. -They pursue you across the system, whether you are cloaked or not. -Sleepers don't use the gate network, nor follow you to another system by other means. Also, in cooperation with the Energy Science Fleet, a new discovery has been made, one that can be used against them. The technique of 'Grid-Fu' confuses the Sleepers. If they get separated through this, they even stop moving & scanning! The only activity they perform in this state is that they return to the location after you bumped them away, but that's about it. If these immobilized Sleepers are destroyed, the new group arriving lacks this confused state. The Term 'Grid-Fu' refers to the act of a capsuleer stretching the combat grid beyond it's normal parameters. Extending this combat grid beyond Concord advised boundaries can cause interference with normal ship operating parameters and apparently also with the Sleepers on an extreme level! Arek'Jaalan Scientist Velarra tried her hand at analyzing & scanning the structure with a wide array of advanced instruments, fitted on her Falcon science ship. The extensive scanning of the structure through all these instruments did not yield any result however. A wide array of experiments have been conducted at the Athinard UCS/Pillar, none of them generating any result or reaction. While some folks might think this was to be expected, it remains crucial science. Science is more then just making discoveries, it's about confirming/disproving theories & observations, in order to come to a better understanding. In this light, it's been verified that direct interaction with the structure doesn't seem to sort any effect. While people have performed these tests in the past, they often forgot a crucial part in science: to document their findings, so they are easy to look up for others. In this light, keep in mind, if you go & try things out to get a better understanding, always document & share your findings, even if the result is 'it did nothing' This result is also important! As it means that we have to find new ways to uncover more. On the other hand, Frenjo Borkstar's poking of the Sleepers did create reproducibleactions that was observed by others as well, confirming various findings on their new behaviour ever since they started fighting back. You can find plenty of things you can do in the article 'Arek'Jaalan needs YOU' to contribute to the science community, in order to help everyone to better understand the new mysteries that have popped up across New Eden! A single multispectral ECM as also aimed along the y-axis of the structure, originating from close to the narrow end of the structure, in the direction of the wide end where most of the "lightning" could be observed. This was done during the final period of energy boosting, and the first period of energy draining. Thank you for this info! I added it into the report as any form of attempted interaction matter, no matter the outcome.